Mother and her little son painting with colorful finger paints. Boy in focus, mother sitting with her back to camera. 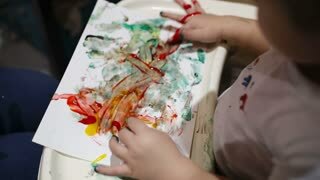 Little boy painting with colorful finger-paints. Activity for children. 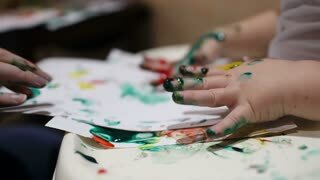 Close-up of mother's and her son's hands painting with colorful finger paints. Young brunette woman holding little boy on the coast of the beach. Mother kiss her son, pointing with finger at horizon. Back view of single mother holds her little son in hand and walking in the night road. Woman immigrates with little boy.